Who wouldn't want to share this??? This just came in the mail. Been eyeing one for years. 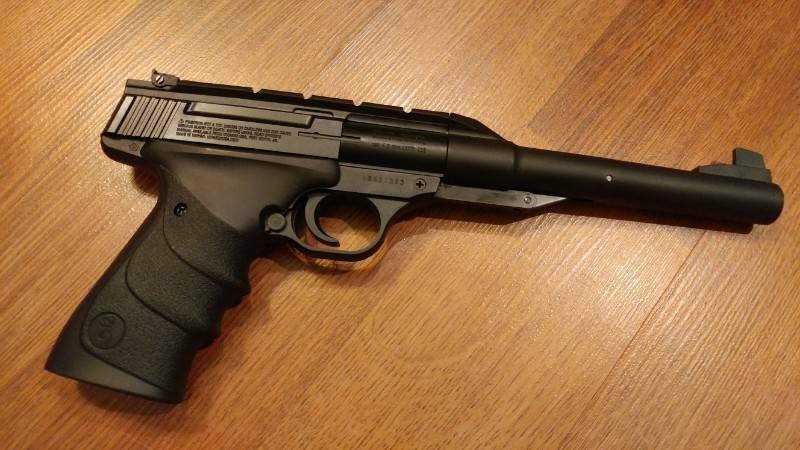 Holy It's soo much a better pistol than my Ruger 2245 MKIII. Fit's like a glove. With the target grips it's a little harder to release the mag, by switching the grip. But yes GOLD gun. Factory anodized. 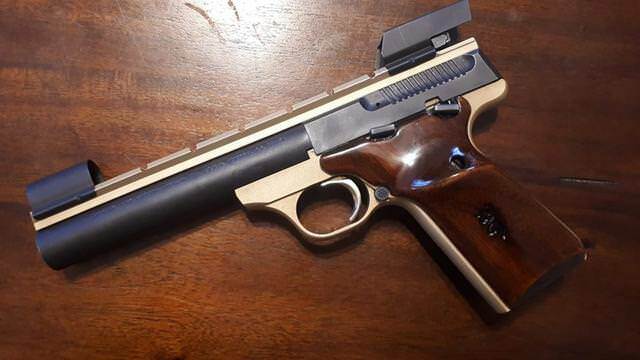 1991 manufacture, Bull barrel, 22LR Buckmark Gold Target. Yes it got hooded sights. Now I need to wait for the paperwork to hit the range..
Love the buckmark. This one is just too cool. Great purchase. The wife dislikes poser. Every 2nd car or vech here, has a Browning Banner or sticker plastered on them. Every corner store selling Browning endorsed crap. Hipster kids wearing cabelas and bass pro hats. Some are not even outdoor people, NOR even own a Browning. So when she look at the gun. She seen the Browning Logo. WELL... She was like.. It has a browing logo, so you HAVE to remove it ! But I chuckled. WELL It has Browning Logo. Because It's a Browning pistol. There are a lot of browning stickers going around even in my end of town but they do make some fine firearms. The Citori comes to mind. Downside about the Gold Anodizing are those sight hoods. They can shift and scratch the finish. Apparently it's one of those guns. That you clean what you can see, reach and don't take apart. Well they're starting to slack like every other manufacture in this day and age.. The Quality now wasn't what they were 10-15 years ago. But this factory trigger is way better then the aftermarket, I had to put in my Ruger. AND that still not even as good. There is no mag safety to deal with. The slide can be released by pulling it back and sling shot it closed. First Friday of every month we do PPC with rimfires. It's mainly newer buckmarks, M&P22, Rugers and with the odd S&W Victory. Only issue because the RH molded grips. May be a little tricky on the LH shooting stages. I'll try and get out this week, but several meetings and appointments. And the indoor range system is busted. So not sure if that fixed yet. Well done, leadslinger. The Browning semis are the best. My only Browning is a 26" bl. .300 Mag. So I was looking on line for a disassembly manual. There is none. There are videos online. But Browning does not recommend you take the gun apart. So you clean with a brush and what you can reach, with the slide back.